At Inova Alexandria Hospital, we believe the birth of your baby should be a joyful experience. That’s why we have a commitment to provide you with the educational, emotional and medical support you need and deserve at this very special time. We recognize that your expectations are unique, and are proud that our experience and expertise can help you develop your own birth plan within our family-centered approach. With close to 4000 deliveries each year, Inova Alexandria Hospital provides highly advanced technology while maintaining an all-important personalized approach. We understand that the experience of having a baby is different for every new mom. That’s why we are happy to help you tailor your birth plan to fit the needs and wishes of you and your family. Some things to consider in creating a birthing plan include: What method of childbirth do you prefer? What type of pain management have you considered? Will your birth be attended by a nurse-midwife? Would you like your partner to stay overnight? Whatever your preferences, our OB/GYN physicians, nurse-midwives and nursing staff will work with you to fulfill them. If your pregnancy is high-risk, you may be referred to the Brock Antenatal Testing Center for consultation, where we will respond to your needs and make your experience as pleasant as possible. If needed, our Level III Neonatal Intensive Care Unit (NICU) stands ready to provide specialized care for your newborn. Why choose Inova Alexandria Hospital? Over the years, thousands of women in Northern Virginia have looked to Inova Alexandria Hospital as the ideal environment to deliver their babies. From routine pregnancies using natural childbirth to high-risk pregnancies that may require specialized neonatal intensive care, we provide high-quality medical care with a warm, personal touch. 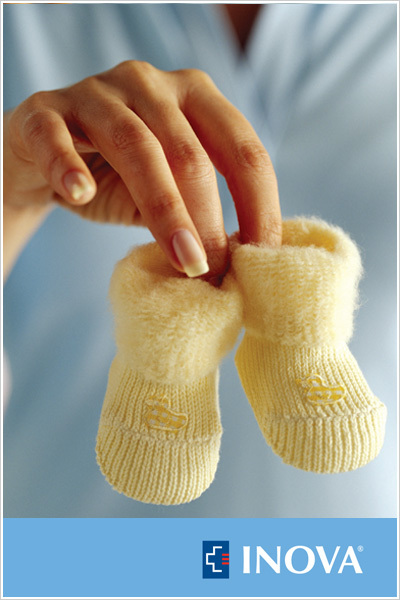 Having a baby at Inova Alexandria Hospital is the right choice for you and your family. It’s no wonder that Inova Alexandria Hospital Women’s Center is the first choice for thousands of area families. From the moment you check in to our hospital, you’ll know you are in caring, capable hands. We’ll assess your condition, identify your needs and develop an individual plan of care. Then we will provide whatever resources best meet your needs. Inova hospitals use a multidisciplinary approach. You’ll benefit from our highly skilled and seasoned nursing staff, as well as from anesthesiologists, neonatologists, perinatologists and other specialists available around the clock. Our baby’s doctor and nurse told me what to expect before our daughter’s [emergency cesarean] delivery and answered dozens of my questions with patience, humor and understanding. We were impressed with all of the nurses in the NICU, and I cannot help but see them each time I look at my daughter and wife. – Paul H.
The Brock Family Antenatal Testing Center is dedicated to helping obstetricians and nurse-midwives to care for pregnancies that may experience for maternal, fetal or obstetric complications. Our physicians and high-risk perinatal nurses offer specialized consultative services to patients, from prepregnancy counseling through delivery. A perinatologist, or maternal-fetal medicine physician specialist, works with you and your OB/GYN or midwife to meet your special needs by offering genetic counseling to parents who are considering pregnancy, state-of-the-art diagnostic tests to determine the health of unborn babies, and ongoing care to women whose pregnancies are considered high-risk. Even before becoming pregnant, prospective parents may come to the Antenatal Testing Center to discuss the implications of age, complication in previous pregnancies or current health problems. Couples with a family history of genetic complications may discuss personalized prenatal options and diagnostic procedures, and receive specialized support throughout their pregnancy. At Inova Alexandria Hospital, you will spend your entire birthing experience in one comfortable, homelike room — your labor, delivery and recovery suite. Research has shown that relaxing, familiar surroundings ease the birthing process. Our birthing suites combine soft, soothing colors, subdued lighting and comfortable furnishings with the high-tech equipment you would expect should the need arise. Your private bathroom, complete with a sit-down shower, will add to your comfort. All of our rooms are equipped with state-of-the-art monitoring equipment, providing high-tech care with a soft touch. Our compassionate, highly trained nursing staff will provide the special care that you and your family deserve during this wonderful time. We realize that your birth plan includes things that are important to you and your family, and have a commitment to helping you follow this special plan. We encourage you to share your experience with your family and invite you to bring them to witness the birth if you wish. After delivery, we encourage everyone to get to know your newest family member. We also recognize that private time is as important as supportive care. In the event you have a cesarean section, the surgery will occur in one of our three operating rooms with recovery following in the Post Anesthesia Care Unit (PACU) in Labor and delivery. This area is equipped with state-of-theart monitoring equipment, providing high-tech care by the same compassionate, highly trained nursing staff who provide care in the labor suites. The PACU is the same area that mothers who are having scheduled cesarean births will be admitted to for preparation of surgery and remain in after recovery. After your initial post-birth recovery, you will move to the Family-Centered Care Unit. Our postpartum rooms are private and feature a chair-bed, to make your support person’s extended stay more comfortable. Our visitation policy also gives grandparents and siblings lots of time to bond with your newest family member. (Please note that for the health of your new baby, children 12 and under who are not siblings will not be allowed on the unit.) Your care will be provided by a staff of nurses and clinical technicians. Coordinated family centered care minimizes any separation between you and your newborn. My wife and I have been extremely fortunate to come into contact with your doctors and nurses during the birth of both of our sons. If we have more children, there is no doubt in our minds that Inova Alexandria Hospital is the best place to be. – James M.
Our patients’ safety and security is very important to us. We have a special newborn-protection system in place that we will review with you after admission. You will receive full instructions about how we secure the safety of your newborn baby. We strive to offer support to all cultures and ethnic groups. Our knowledge and skills regarding cultural diversity strengthens and broadens our ability to care for you. The goal is to optimize your care by acknowledging specific cultural factors and differences, and providing support to you and your family. Unexpected complications can occur during pregnancy, requiring additional diagnostic procedures. These tests can evaluate the health of both the mother and baby, even during the first few weeks of pregnancy. The Antenatal Testing Center offers the most recent approaches in the diagnosis and treatment of obstetrical problems. The staff at the Antenatal Testing Center is composed of highly skilled, board-certified perinatal nurses and OB-credentialed sonographers. These nurses monitor high-risk mothers to reduce their risk level and work toward the birth of a healthy baby.